Universities, apart from their pedagogical role, as centers for fundamental academic research are vital to agricultural research and development. The sericulture sub sector of Indian agriculture has been a beneficiary to this. Indian sericulture has received kind attention of her agricultural universities, located at those places known for sericulture. 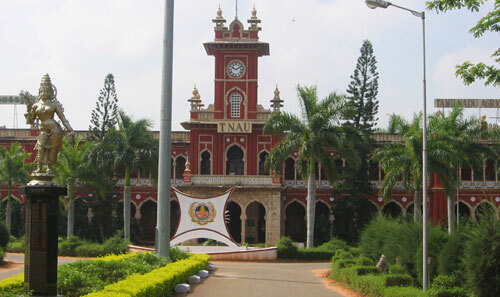 University of Agricultural Sciences (UAS) Bangalore and Tamil Nadu Agriculture University (TNAU) are prime examples. Both these institutes have been training manpower for research and extension for long. UAS, Bangalore has been conducting an under graduate program - BSc Sericulture for past few decades. This four year’s graduate degree program has produced a prodigious volume of alumni who decorate coveted positions in the industry. An academic program need not necessarily ensure job placements to its takers. However the quality of the curriculum and its administration are very important in throwing open employment opportunities for students who opt it. Agricultural Universities are hot spots for admission seekers not just because agriculture is a very important discipline. The multiplicity of job opportunities available in public and private sector is an important reason. Recently TNAU has started a BSc sericulture program. We interviewed Prof. (Dr) CA. Mahalingam of Sericulture Department, Tamil Nadu Agricultural University regarding their new initiative. In the given scenario of declining sericulture and falling prices for sericultural produce, what is the scope of sericulture in Tamil Nadu? Yes sericulture is declining area-wise. Statistical data show that area has decreased many folds but the production and productivity has increased many folds too. Thanks to the many latest technologies right from Mulberry Nursery to User friendly mountages to Automatic reeling machines to Computer aided weaving designs. In Tamil Nadu after a decline in area due to Papaya mealy-bug during past two years, at present the increase in area is being witnessed. In Karnataka the area is declining but there are lots of reasons for this, one important reason is their mind block in adopting newer technologies. Prices have not dropped very low during the past five years. There was one low during 2006. But now that due to wrong policy of government (to decrease the import duty of silk) has created some melee. But even after that the prices have stabilized now and it is around Rs. 180 for MV and Rs.240 for BV which is little above Rs. 100 profit for every kg of cocoon. The prices will remain like this atleast for another 4-5 years, keeping in view the growing demand. Is there a declining trend in employment opportunities for those who are qualified in sericulture? How is the curriculum for the new course designed to meet this challenge? I take this argument in another form. The opportunities for any graduate, for that matter are not promising. Though all the undergraduates in TNAU passed out during past few years got employed, I can say that they are not employed in either government sector or directly with farming sector. Of course, I agree that efforts have to be made to get sericulture graduates given preference and opportunities in Central Silk Board, State Departments of Sericulture and other sericulture oriented industries. The syllabus for BSc sericulture is formulated in such a way that 50 % courses are common to agriculture graduates and sericulture graduates, and both of them learn the same basic courses. Only from third year onwards sericulture graduates learn specialized subjects on sericulture. This will empower them to compete along with agriculture graduates in every aspect either for higher education or for job. Why should a student choose BSc sericulture? - to be a trained farmer? Extension officer? Researcher? Do your program stress on biotechnology? For the basic degree program, there is no much stress on biotech and molecular biology except for few introductory courses to expose them to the technology. In answering thesecond question, I suggest you to read the following article by Himanshu Pal: Government Jobs after B Sc Sericulture . As I have already said there is no direct employment for any graduate. Any graduate is armed with quality education either to become an entrepreneur (farmer? ), a government officer (state or central government or private companies – extension worker?) or scientist (in SAU or CSB or private firms – researcher?). I'm karthik.I've finished 6months certificate course in Sericulture given by IGNOU University. Is there any job opportunity in Tamilnadu Sericulture dept regarding this course?